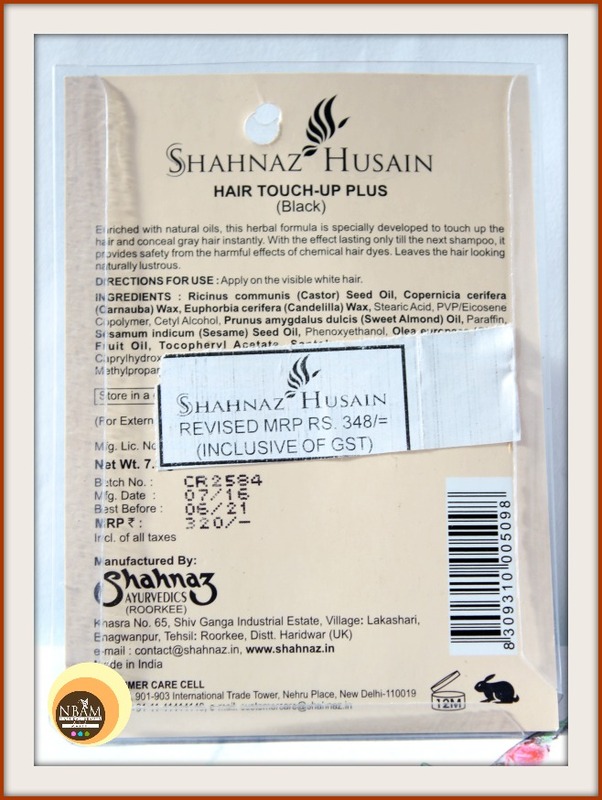 Enriched with natural oils this herbal formula is specially developed to touch up the hair and conceal gray hair instantly. With the effect lasting only till the next shampoo, it provides safety from the harmful effects of chemical hair dyes. Leaves the hair looking naturally lustrous. Apply on the visible white hair. Ricinus Communis (Castor Seed Oil), Copernicia Cerifera (Carnauba)Wax, Euphorbia Cerifera (Candelilla) wax, Stearic Acid, PVP/Eicosene Copolymer, Cetyl Alcohol, Prunus Amygdalus Dulcis (Sweet almond oil), Paraffin, Sesamum indicum (sesame) seed oil, Phenoxyethanol, Olea europaea (Olive)fruit oil, Tocopheryl Acetate, Santalum album (sandalwood)oil, Caprythydroxamic Acid, Pentaerythrityl Tetra-dit-butyl Hydroxyhydrocinnamate, Methylpropanediol, Aqua (water), D&C Black No. 2 (CI77266). To be honest, I have a lot of grey hair 😢 (hereditary issues) and to cover them I dye my hair with natural Henna once a month. But the hair roots turn white within a week! So I use this magical product as root touch-up to conceal those whites instantly 😍. Although this product has natural ingredients, I don’t use it daily. I use it only when I’m going out, travelling or any special events. 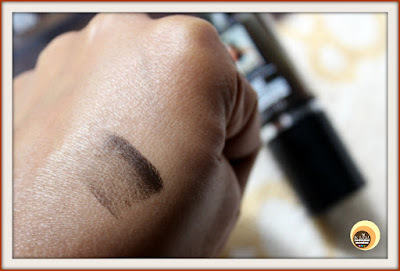 Earlier I have tried another hair dye stick –TRU TONE, however, that was quite drying in nature so didn’t like it. Talk about its ingredients, this Instant Hair Touch-Up Plus contains Castor Seed Oil, Carnauba wax, Candelilla wax, sweet almond oil, sesame seed oil, Olive Fruit Oil to name a few. Both Candelilla wax and Carnauba wax are the plant-derived substitutes for beeswax and these are widely used in cosmetics, colouring, non-colouring hair care products and skin care products as the texture enhancer. 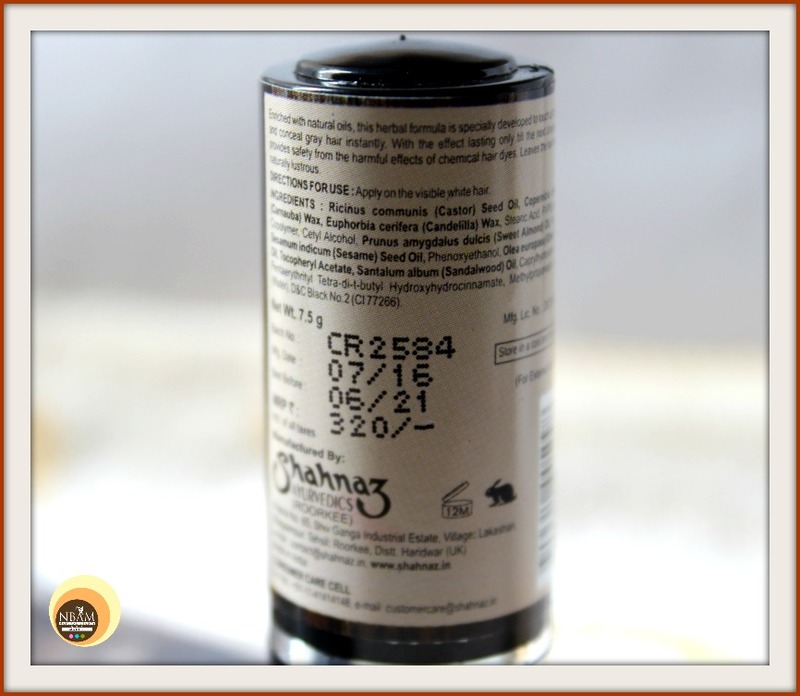 At the same time, it also contains preservative Phenoxyethanol which may trigger allergies or skin irritation. Overall, the product has lovely ingredients beneficial for our hair and skin and is safe as well. Before using any product on your hair, ingredients check is necessary, especially if you’re facing hair fall! 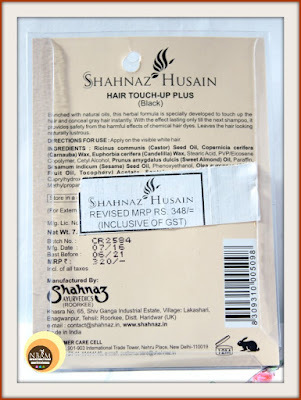 Shahnaz Husain Instant Hair Touch-Up Plus comes encased in a small cardboard box where all the product related information is mentioned. The product itself comes in a stick version, lipstick or stick foundation sort of packaging you can say! It has a twist-up mechanism so it’s easy to use and travel-friendly as well. 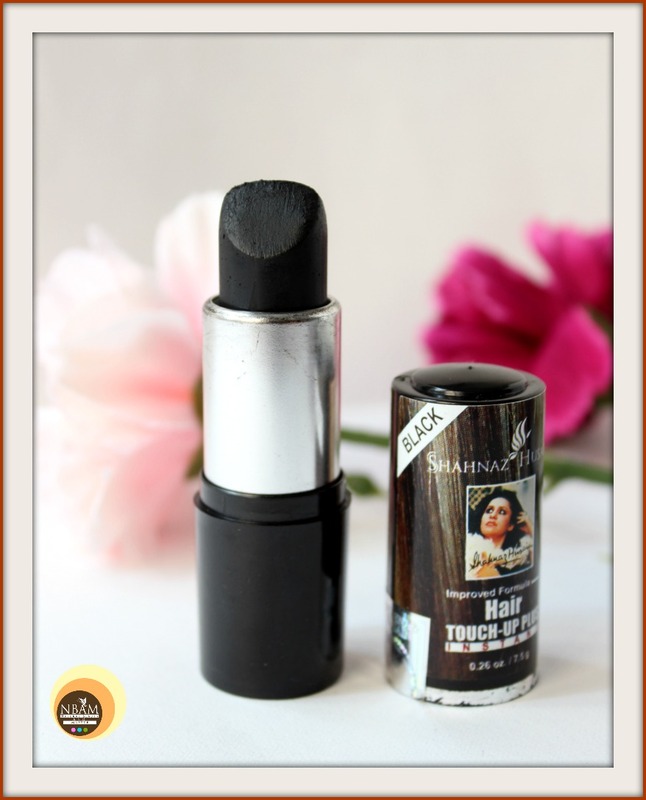 This Instant Hair Touch-Up Plus comes in two shades – Black & Brown. I selected black and it suits my hair colour also. I will try Brown next as my hair colour is blackish brown! The texture is creamy and has a mild scent to it. The application procedure is pretty simple. You need to apply this to your dry hair and not wet hair as it won’t work then. I make small hair partitions first and then apply it to the roots and on grey hair. And voila! All set 😊! It’s that easy to work with this product. As the formula is creamy and highly pigmented, be cautious when you’re applying it. It covers the grey hair instantly giving a natural look. The best part, the colour lasts till next hair wash and in between, you do not need to apply it again. I am completely satisfied with this shade and its lasting power. 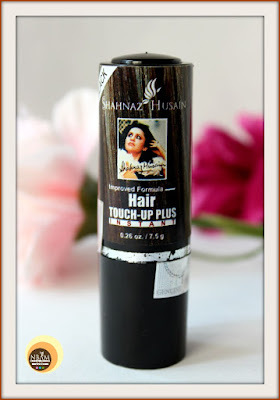 It neither irritates the scalp nor has caused any excess hair fall (touch wood)! However, keep in mind, it has natural oils so your hair may feel a bit sticky post usage. It’s not that greasy but yes, I feel it makes my hair look flat. The coverage is good but it works great when applied to a few strands. My mom is aged now and her tresses are completely grey, in this case, this product will not be efficient to cover the entire white hair zone. She has to dye her hair with other alternatives! Also, do not touch your hair post application as it may stain your hands! I have that habit of touching and playing with my hair, but every time I touch, I can see the black stain on my fingers 😐. This is why I usually apply it only to the roots and not on the strands. 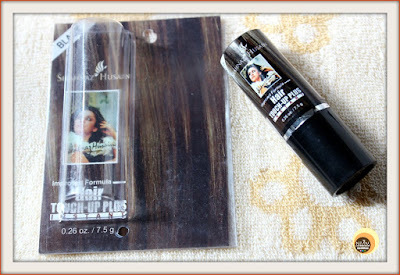 The creamy formula makes hair a bit oily/sticky if applied too much! 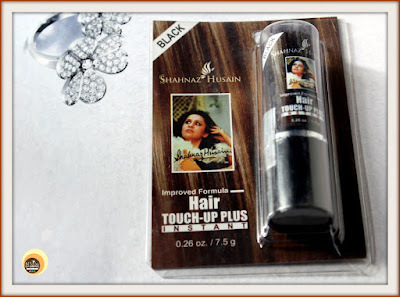 Shahnaz Husain Instant Hair Touch-Up Plus Black is a temporary hair dye stick which turns white hair into the black in a jiffy. Overall, this product works excellent as a root touch-up and is certainly my go-to hair product these days. 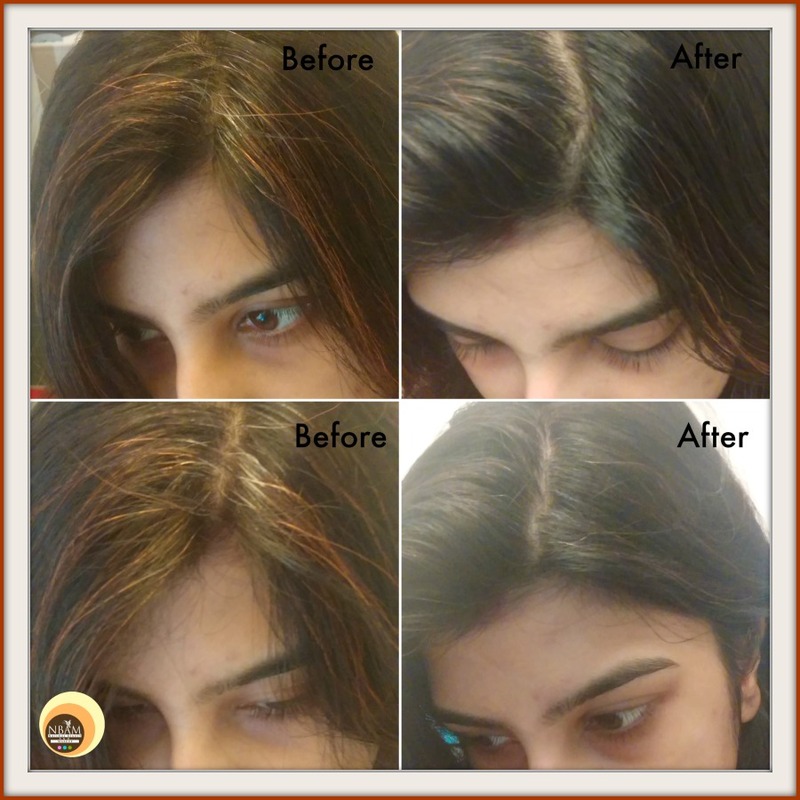 If you are also suffering from a premature hair greying issue or you want to conceal those white hair roots quickly in between your next colour-session then you must give this product a try! Hope you find the review helpful 😊. 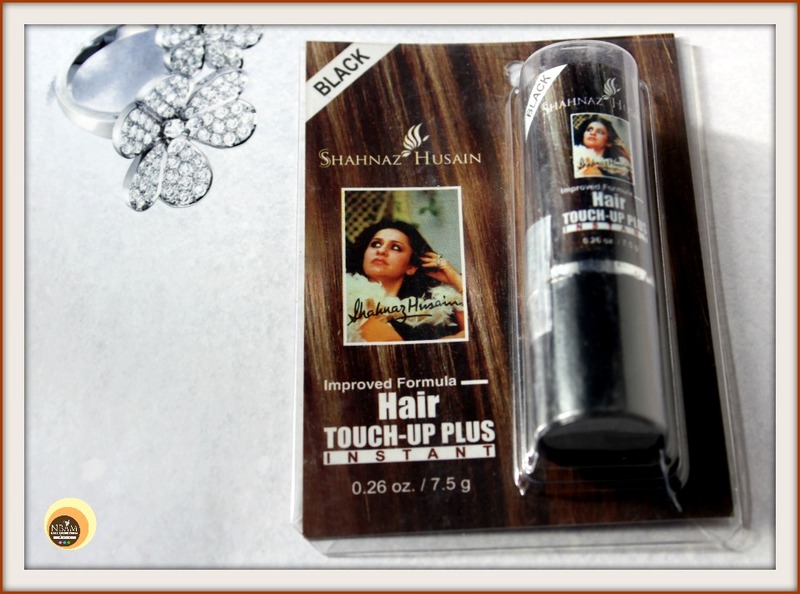 Have You Ever Tried Shahnaz Husain Instant Hair Touch-Up Plus? If Yes, Please Share Your Experience With Me In The Comment Section Below. Good to know something like this exists..this is such and easy quickfix ehen you do not have time and want to go out... I qould love to egt this for my mom and mom-in-law .. This seems like such an interesting product. However, I don't think it would work for me. I'm forever touching my hair lol! I'd end up touching my face afterward and it would be a disaster.